The driving force behind the sport of eventing is the many amazing volunteers! The USEA Volunteer Incentive Program (VIP) presented by Sunsprite Warmbloods exists to increase the ease of participation, provide incentives, and recognize the tireless efforts of volunteers. Supporting and empowering volunteerism has been highlighted in recent years as the Association has looked for ways to recognize these unsung heroes. The program’s roots first began to grow thanks to the many efforts of the late Seema Sonnad, and they continued to grow thanks to the ongoing commitment of Seema’s fellow volunteer enthusiasts. The USEA Volunteer Incentive Program (VIP) presented by Sunsprite Warmbloods was officially born in December of 2015 when the USEA Board of Governors voted to approve the new program. In 2017, after the success of Area II’s pilot project, VIP rolled out an online management portal nationwide. Available through this website or the smartphone app for iOS and Android devices, the portal is designed to streamline the volunteer process for both volunteers and organizers. 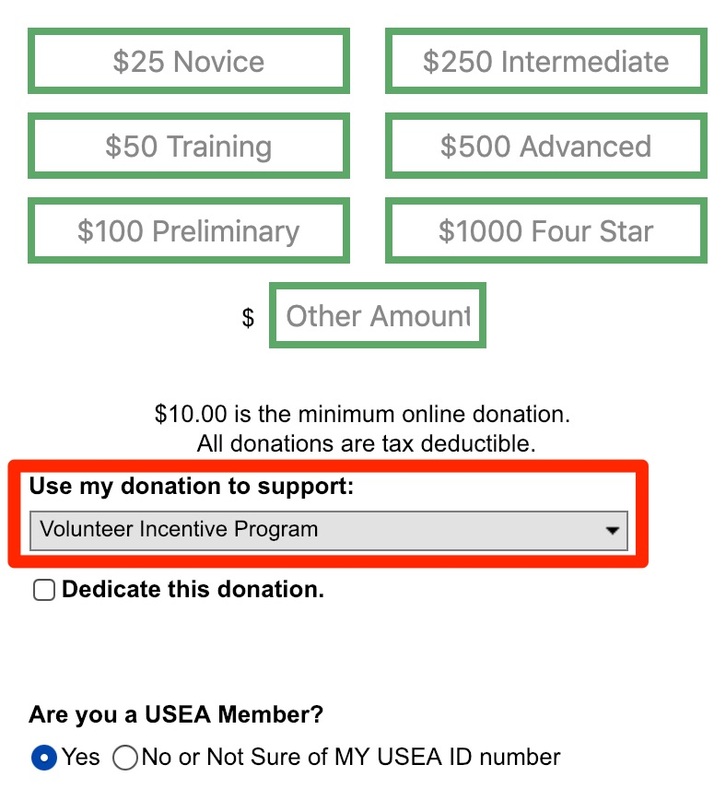 Go to the USEA Foundation donation page. Make sure to select Volunteer Incentive Program in the 'Use my donation to support' drop down.